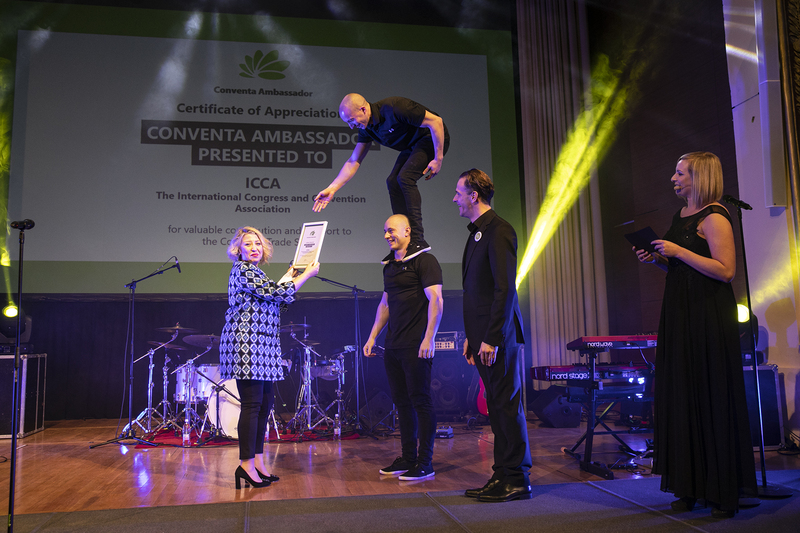 Ljubljana, Slovenia -- As recognition for its contributions to and strong support of the development of the international association meetings industry in the New Europe region, as the Conventa trade show calls Southeast Europe, ICCA was named as Conventa Ambassador for 2019 at an official awards ceremony during the 11th edition of Conventa in Ljubljana on 23 January. Held on an annual basis, Conventa, the New Europe trade show for business meetings, congresses and incentive travel, recognises an individual or company that has been their longstanding partner and greatest advocate with the prestigious Ambassador title. Among all the participating associations, the International Congress and Convention Association was chosen as the 2019 recipient of the award due to its long-term partnership with Conventa’s organisers. A strong supporter of the trade show since 2011, ICCA’s collaboration with Conventa has resulted in the growth of a strong, robust partnership centred around education, industry advocacy and strategic support, which has helped the event grow into a key centre of business and networking opportunities for meetings industry professionals from emerging destinations in New Europe and beyond. Working closely together on the development of several initiatives, one of the main outcomes of the partnership between ICCA and Conventa has been an ongoing educational project training regional organisers in the field of associations meetings. As part of the project’s implementation, ICCA hosts a seminar on an annual basis during Conventa’s education programme, bringing together international association and meetings industry speakers to Ljubljana to share their expertise on a variety of topics affecting meeting professionals in the region. This year’s seminar, held on 24 January, focused on the benefits of regional cooperation for driving new business. Accepting the Conventa Ambassador Award on behalf of ICCA during the awards ceremony at the Grand Hotel Union, Elif Balci Fisunoglu, ICCA Regional Director Europe, said: "Conventa is an important vehicle for ICCA to help in shaping and guiding the future of international association meetings in Central and Southeast Europe, and as fellow advocates of the value of the association sector for destinations, we are proud to have established such a strong working partnership with Conventa organisers as the years have gone by. By supporting them in their work, we aim to contribute to the development of the meetings industry in the region, grow ICCA membership and advance the professionalisation of the meetings industry as a whole. "We would like to thank Conventa immensely for naming us as Conventa Ambassador 2019. This is incredibly prestigious, and as recipients, we are honoured to be joining a group of such legendary meetings industry figures. ICCA is excited for our future collaboration, and we look forward to seeing Conventa develop the meetings industry in their region even more in the future – we will be right by their side as a strong and supporting partner!" Miha Kovacic, Director of Conventa, said: "We have been tremendously proud and grateful that ICCA, as the huge global association that it is, has been for all these years collaborating with and supporting Conventa as the trade show in its promotion and development of the New Europe's meetings industry." Gorazd Cad, Co-Founder of Conventa, said: "ICCA is opening for Conventa the doors to the world of associations and globally spreading the good news about us, and this is priceless. At the same time, ICCA contributes to the quality of the event itself, but most importantly, to the quality of the hosted buyers." The 11th edition of Conventa is taking place from 23-24 January 2019 in Ljubljana, Slovenia. Download the image of the Conventa Ambassador 2019 award ceremony in high-resolution. The award is dedicated to Rok Klancnik who, as the head of the Slovenian Tourist Board in Brussels, had been taking care of promotions since Conventa’s beginnings. He set an example as the biggest ambassador of the Conventa trade show. 2016 Stella Ariadni Constantinou, Professional Meeting Planner PCO, Strategic Communications Consultant, CEO. Conventa is the New Europe trade show for business meetings, congresses and incentive travel that will for the 11th time reopen its doors on the 23rd and 24th of January 2019 in Slovenia’s capital Ljubljana. This year, exhibitors from more than 15 countries and hosted buyers from more than 44 countries will hold more than 3000 meetings. The organisers (Slovenian Convention Bureau and Toleranca Marketing) promise that Conventa will again be a meeting point of New Europe, full of energy and genuine Slovenian hospitality.